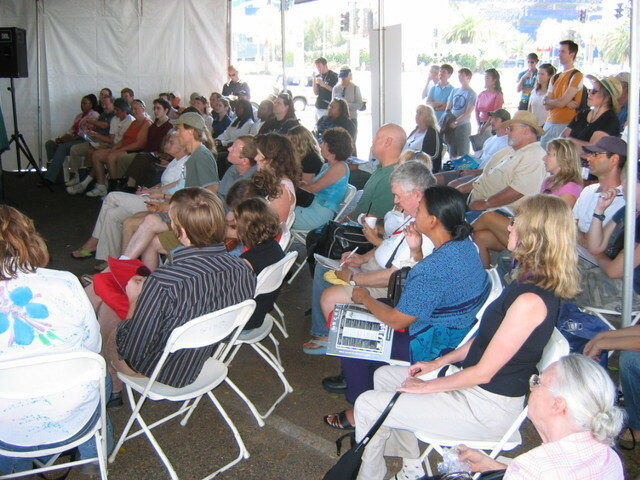 And it's noteworthy that novelists appeared to outnumber screenwriters in this crowd by about three to one. Impressions: Sherman turned in one of the most startlingly rude performances we've ever seen from a moderator, and we learned that Robbins is apparently recovering from a bout of West Nile Virus. Their advice? You've heard it all - do your homework, write a clean query, the writing is what counts. Nothing new under the sun. 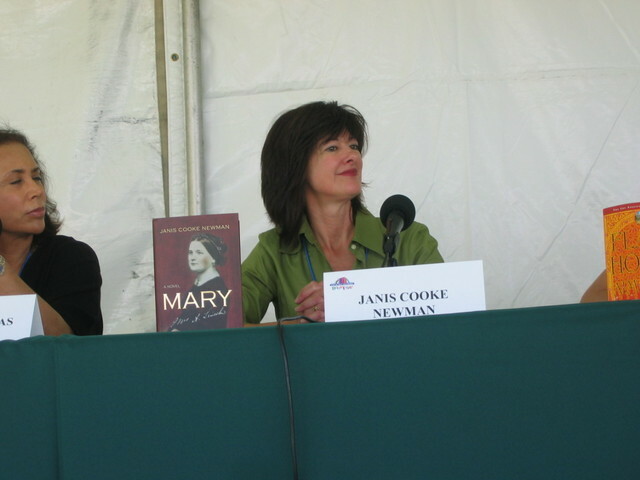 Other than Sherman, with a straight face, touting his client John Updike's latest, Terrorist, as a terrific read. 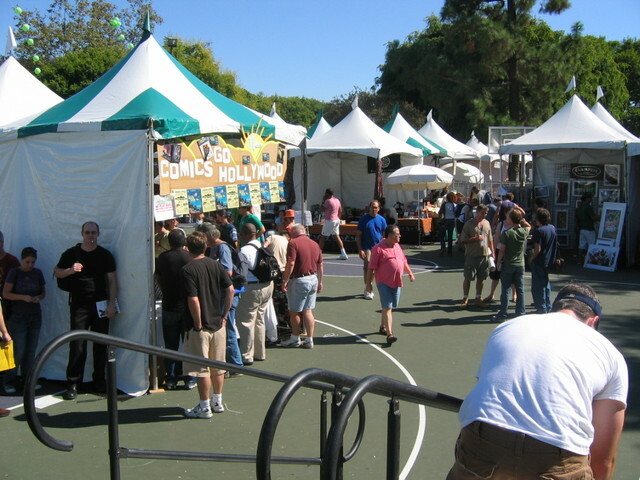 Plenty of booths and vendors to take your money, the usual suspects including Book Soup, Skylight and the Bodhi Tree. Comics types will be pleased to note the presence of a dedicated Comics section. 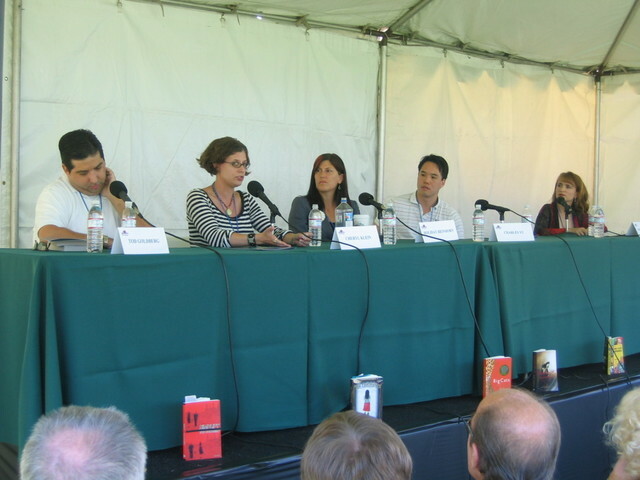 Sibling Writerly: Tales from the Goldberg Siblings. 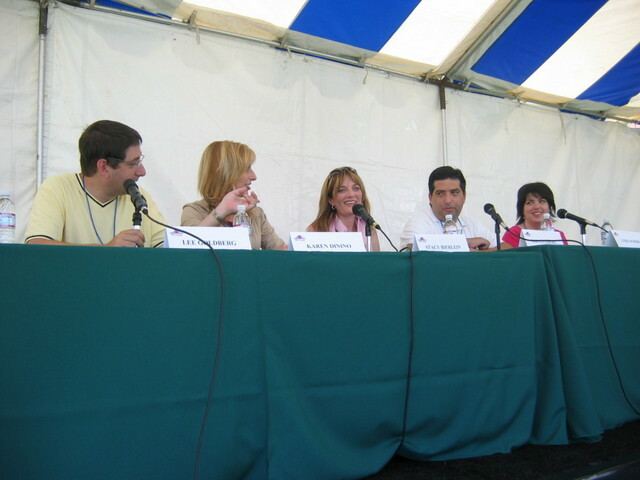 l. to r., Lee Goldberg, Karen Dinino, Stacey Bierlein (moderator), Tod Goldberg, Linda Woods. We would have made the trek down from the Palisades for no other reason than to kick it with the Goldbergs. Do they have their own theme song, we wondered, as they took the stage. We learned that Lee's impersonation of his wife's French accent makes her sound uncannily like Inspector Closeau; that Linda is the "quiet, shy" one (the George Harrison of the Goldbergs), and that the Goldbergs are in unanimous agreement that Tod had the worst hair in the 80s. A highlight was Tod's apoplectic paroxysm when we asked if the disdain of "theme" was a common Goldberg family trait. Old Lady 1: Shouldn't we wait for a minute? Maybe we'll want to stay. 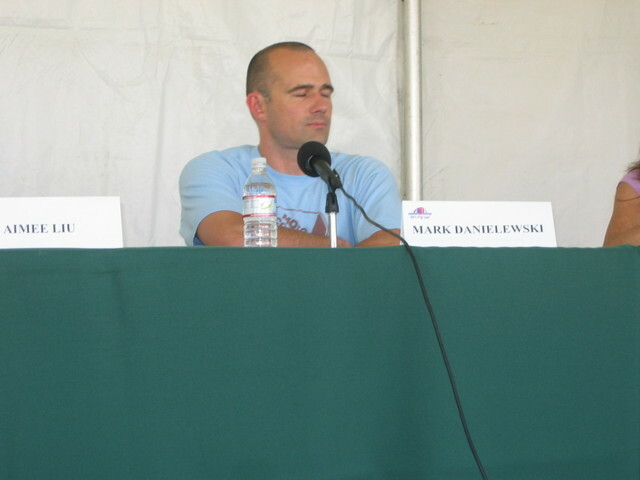 ... and Mark Z. Danielewski (wearing a "More Cowbell" t-shirt), caught in a moment dreaming of new ways to torture, um, bedevil his reader. 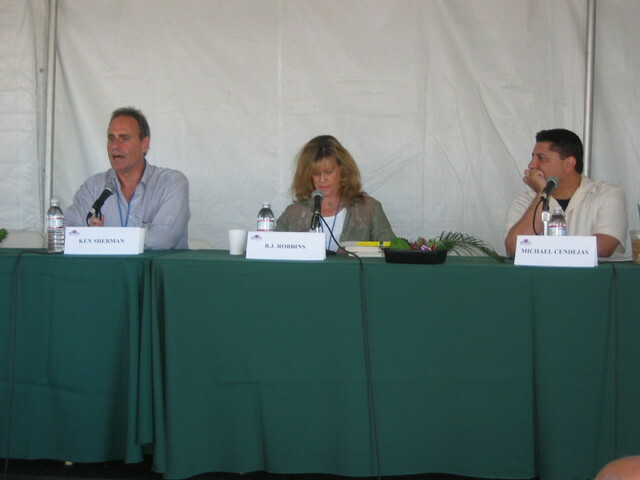 The panel, moderated by Leslie Schwartz, was perhaps the most interesting of the day and touched on questions previously wrestled with here about genre distinctions and their meaning and value. When does your fair taking place in 2006? How may I obtain more info?